Note: LED light is not included. This compact softbox diffuser is widely used for diffusing some harsh led light and reducing unexpected shadow on the object you are shooting to achieve more natural and balanced look. 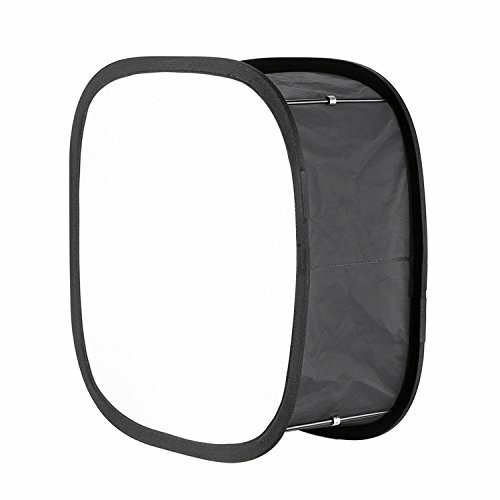 Come with magnetic locks, this softbox can be easily collapsed into a small size or expanded fully with the support of these magnetic rods. Designed with attachment straps, the softbox can be attached to a LED panel directly by using attachment straps; Easy installation and simple pack up. Light enough during a long time journey; No added weight when it is installed on LED light. Carrying bag included offers a great convenient in your outdoor event. It will be a great photographic necessity for portrait, YouTube video shooting.